Below are some stories from the real people that we work to serve and make better! When West Chester University student Chris was in a motor vehicle accident ten years ago, his family was determined that he would be able to live at home. During his stay in the Bryn Mawr Rehabilitation Facility, his parents tried to navigate the complicated world of locating service providers, sourcing assistive equipment, and determining costs on their own, to prepare for their son’s return home. 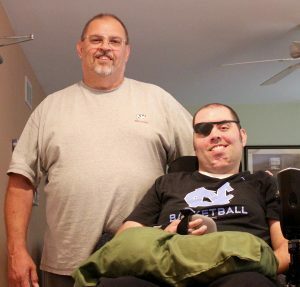 While developing a plan for his son’s future, Chris’s father, Steve, found out about the Pennsylvania waiver program and began working with the Cerebral Palsy Association. The service coordination provided by the agency was a relief for the family, who attended several support groups but found them to be mostly focused on legislative issues and therefore unhelpful for locating assistive services. “Without an agency like CPA, you’re left on your own to Google things and try to figure it out,” said Chris’s father. Chris’s parents and CPA have worked together over the years to develop plans for reliable nursing and personal services, as well as home and vehicle modifications to support Chris, who suffered a traumatic brain injury and uses a wheelchair. Safety and accessibility at home are top priorities, to ensure that Chris is able to remain as independent as possible, and that his family and home care workers have the equipment they need to further that goal. CPA has worked with Chris’s family to provide significant home modifications, including a ramp and exit at the back of the house for Chris to use in case of an emergency, a “fantastic” bed adapted to Chris’s needs, and a ceiling lift to make transfers safer and simpler. “When things change, like the state cutting back on services, Kim (Chris’s CPA service coordinator), is proactive. She’s good at trying something new, at trying everything. She’s not afraid to go ask for things Chris needs. Anytime I see something that might be needed, like the ceiling lift to avoid injuries at home doing transfers, Kim is proactive at getting the state to pony up for the equipment we need,” says Chris’s father. recently returned from a family trip to visit his sister and spend time at the beach. The trip was made possible in part because of a portable lift that the family and agency located, and though the trip was cut slightly short due to limited bed options, Chris and his family were able to enjoy spending time together on vacation. situations. Knowing to take the bull by the horns and you know it’s a challenge for you, but be willing to challenge yourself and see how far you get,” says Chris’s father. determination and hard work to ensure his independence and expand his opportunities. “We and CPA do what we can with what we have,” says Chris’s father, and both are dedicated to continuing to do so for years to come. When Faith was first diagnosed with Down Syndrome, before she was born, her mother and father were initially frightened and extremely worried. “When we got the diagnosis with Faith, it scared the living you-know-what out of us,” said Emma, Faith's mother. They were offered the option of terminating the pregnancy, but they decided against it, and prepared to welcome her with the challenges accompanying her condition. Faith's progress has strengthened the whole family's bond. “At first, even though Faith has three older siblings, I felt like a new mother again. There was this fear of not having a “perfect” child, but you need to see the beauty in your own children, each as they are. Her siblings just see her as Faith, not as a child with Down Syndrome,” says Emma. Faith's mother says she is a typical toddler who loves color and dancing and music, as well as playing with her older siblings' toys. She loves to cuddle and give hugs and waves and kisses, and always looks forward to seeing and playing with her therapists. “She absolutely loves to dance to Coldplay's “Adventure of a Lifetime,” and she really is the biggest and most beautiful adventure of our family's lifetime,” says Emma. Engaging in communal activities and developing a supportive social structure of friends and family are both important goals the CPA works with consumers to achieve. Tim, who has cerebral palsy and has been with the CPA for the past seven years, was introduced to the agency by a friend who was attending the local Main Line Health Rehabilitation Associates STEPS program. STEPS, which is based in Exton, is a half-day program designed to address work-readiness, social skills development, and cognitive ability. Perhaps most importantly, it provides a supportive community and positive social environment for its participants. Tim’s friend encouraged him to join STEPS, and recommended that he use the CPA to manage the waiver program that helps make STEPS accessible. In 2015, Tim, who is hearing-impaired, informed the CPA that he needed new hearing aids to fit his changing needs. Though his hearing aids had previously been covered through the PA state waiver program, the state denied his request. The CPA helped Tim appeal the state’s decision, arguing that the hearing aids were necessary for Tim’s day-to-day activities and quality of life. Following the appeal hearing in 2016, the state again denied the request, though the judge recommended that it be approved. Tim and his service coordinator, Judi, sent a letter to the Secretary of Health and Human Services for PA, explaining the series of events and asking again that the state reconsider. In the meantime, Tim and the CPA began looking for alternatives to state funding for the hearing aids, and came up with the idea of creating a GoFundMe page. Tim, who enjoys making videos and doing graphic arts, put together a video explaining his situation. Within a week, the page had raised enough funds to cover the full cost of the hearing aids and Tim was able to quickly get his new set. Though the state eventually approved his request in 2017, Tim was happy with the speed at which the GoFundMe solution was implemented. “Judi helped figure out the way around it,” he says. “[The CPA] was trying their best, and ultimately, it all went well.” The new hearing aids have ensured that he can participate in STEPS meetings, attend his vocational and cognitive skills training, and enjoy conversations, music, films, and TV shows with his friends and family. The CPA also has worked with Tim to develop a system for managing his transportation funds. “Judi helped figure out the timing for doing forms and reimbursement checks. It makes everything easier to manage and everything comes in at the right time so I can make it to STEPS,” says Tim. Want to Help Us Create More Stories? Your donation will go a long way to help us serve more people and tell more stories like this.